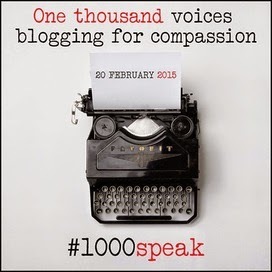 On February 20th, 2015, hundreds of bloggers from all over the world have pledged to share a post on compassion. 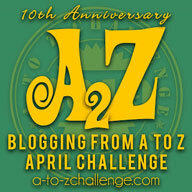 Many have written about this very important topic before already. 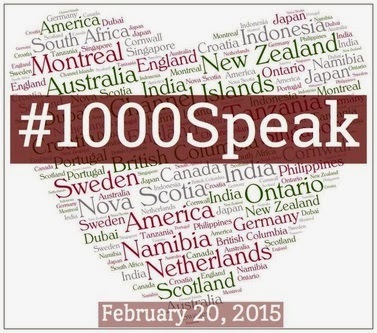 You can check out the blog and Facebook as well as the Twitter hashtag #1000Speak. 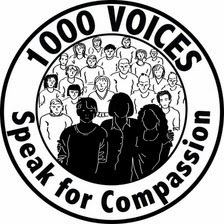 This is my first time and I am so proud to share a short story with you on compassion and do my bit for this great cause. Miss Bose was a middle aged, tall woman with a straight back, well groomed grey hair always tied back in a crisp bun, a kind expression and my neighbour. Ever since I could remember, she had been a great aunt to all the children in my colony. She would give us sweets, crack jokes and tell us stories but was also very strict and used to scold us when we did something wrong. Being a spinster, she lived alone and could be seen tending to her flowers each morning and then sitting on the bench right beside her gate sipping tea and watching us play. She was like an aunt to us and we all loved her. She was a confidante, an inspiration and a dear friend. All my childhood was spent in her company and some of my happy memories included the Christmases I spent with her, decorating the Christmas tree, going with her to the Church, eating the cake she especially baked for the occasion and having fun laughing and watching her enjoy a festival that my family didnt celebrate since we belonged to another religion. The surprises that Santa brought me each year were the highlights of the day and I was sure that if I remained a good girl all year, Santa would definitely bring me a cool gift! Time went by and we shifted to another city. My connection with Bose Aunty shrivelled and then died. I went to college and then got married. It was after marriage that my family again shifted to my old home and when I visited them there that I came to know that my beloved Bose Aunty was sick and had been confined to the bed. I was shocked. I could not imagine that vibrant, full of life woman ill like this but I was sure that the people in the colony would be taking care of her. After all, she had always been there for all of us. So I asked my mom about it. "Ma, I will come along with you when you visit her the next time. I am sure, she would like her rest what with all of us hounding her everytime." My mother looked a bit confused and asked, "Hounding her? What are you talking about?" "Isn't Dayal Aunty sending her the special food she made when I was sick? She used to do that with everyone." I smiled, lost in my own memories of the good, old time. "Ahh..No beti. Things have changed here. Miss bose has been boycotted by the colony." My mother informed me apologetically. "What! Why?" I almost screamed unable to believe what my mother was saying. "There was some quarrel with Miss Bose. She had hit a boy and accused him of stealing which she could not prove. The boy's parents were furious with her and complained to the colony association. There was some more drama but I don't have the details. The end result was that Miss Bose stopped talking to everyone and the colony boycotted her. She has been a recluse since." My mother's words fell on my ears but I just could not process what she was saying. I could not believe that Bose Aunty could falsely accuse anyone of anything and in turn, could not believe that my colony which had been full of loving, caring people who lived like one big family could have become so heartless that they had no compassion left. Had they forgotten how this same woman had loved them? Showered her love on their children? Treated us all like her own family? Supported us in our hour of need? Now that she needed us, she had no one. There was only a maid who came once a day to clean the house and some relatives who dropped by once in a while. My parents checked on her everyday but still she was alone. Alone, miserable and helpless. Thinking about the woman who had been like a mother to me brought tears to my eyes but also made me feel guilty of not having stayed in contact with her. Had I stayed in contact, I would have known about her illness and could have helped her earlier. I knew I could not change what people did but I certainly could do my part. With renewed determination, I cooked a simple broth and went to meet the woman I loved but had not met for years! What is your take on compassion? Do you feel that you have compassion and practice it in your daily life?